APPW Local 153 on strike at Kapstone paper mill in Longview, WA, August 27, over the company’s imposition of contract cancelling health insurance to avoid Obamacare “Cadillac plan” tax. PORTLAND, OR – The Affordable Care Act (ACA), commonly known as “Obamacare,” survived a key legal challenge in the U.S. Supreme Court on Thursday, June 25. The court came down 6-3 against a suit by David King, a Virginia limousine chauffeur for a cartel of conservative ideologues who claimed that it was illegal for the federal government to offer tax credits as a subsidy to offset the cost of purchasing private health insurance, if the insurance was purchased through the federal government-administered marketplace. The ruling, along with the same day’s historic verdict allowing gay marriage nationwide, elated Democratic partisans, who have been all atwitter about the President’s legacy as he enters his “victory lap.” But Chelsea Manning, the transgendered Army veteran serving a 35-year sentence for courageously revealing U.S. imperialism’s war crimes, cautioned that the Supreme Court’s gay marriage ruling didn’t mean equality for all. If the court had gone the other way on the ACA, it would have made it even harder for millions of Americans to afford any kind of health insurance. That only goes to show that in bourgeois politics, “it could always be worse” for working people. If reactionary troglodytes oppose the ACA because god told them to oppose any sort of social welfare programs, especially those enacted by a Black president, it does not follow that class-conscious workers should support it. This law gives billions to the insurance industry out of the pockets working and poor people in the U.S. Class-conscious workers oppose the ACA and fight for a universal, socialized health care system while implacably defending every health care benefit that workers have won as a concession from the employers. And this can only be achieved as part of a broader class struggle against all factions of the capitalist ruling class, particularly the Democratic party. Obamacare is a far cry from universal health coverage. The “insurance” it does provide for millions of working and poor people is often illusory. While it has ensured a steady stream of revenue for private health insurance companies, it has had its intended effect of adding to the pressure on unions to give up their hard-won health insurance programs. And that’s only one of the negative aspects for workers. So let’s go down the list. First up, who is excluded from the ACA? For starters, more than 15 million undocumented immigrants, many of whom work in dangerous jobs like construction, agriculture and food industry, are denied coverage, even though many of them pay Medicare and Social Security payroll taxes from which they will never see any benefit. Class-conscious workers demand full citizenship rights for all immigrants. Second, while private health insurance plans may cover elective abortions, this portion of the insurance cannot be subsidized by the federal government under the ACA. Medicaid coverage is available in states which have accepted “expanded” funding for individuals earning up to 133% of the Federal Poverty Level. But Medicaid is barred from covering abortion since the Hyde Amendment was passed by Congress and signed by the Democrat president Carter in 1977. Combined with the increasing restrictions on abortion in the U.S. as legal traps and terrorist attacks shutter clinics across the country, this means that millions of poor and working class women effectively have no safe, legal option for ending an unwanted pregnancy. Far from a step towards the free abortion on demand that we fight for, the ACA reinforces the legal obstacles to affordable abortion that Democrats and Republicans have put in place since Roe vs. Wade. What of the insurance that is offered? The sick reality behind the statistics of increasing enrollment and decreasing number of uninsured since the passage of the ACA is that for working people, the insurance is an illusion, a scam that will not prevent them from being cast into devastating debt because of illness, accidents or chronic disease. The “bronze” health plans have the lowest monthly premiums. These vary by state, and are expected to increase. Currently they are around $150 per month. Already, that’s a significant “invisible” pay cut for a low-wage worker struggling to pay rent and other essential expenses. Yet these bronze plans can have deductibles of over $2,000 for an individual or $5,000 for a family, and annual maximum out-of-pocket costs of $6,000/$12,000 family. Can you afford that? Many working people can’t. What we have here is literally “insurance” for the insurance companies: a guaranteed customer base that must purchase “coverage” of dubious value, or pay a hefty tax penalty. Yet in the event of a serious illness, they can only expect to see a payout long after they have been squeezed dry by medical bills. Key to this cash cow for insurance companies is the “precarious” workforce of part-time workers whose employers are not required to offer company health plans since they work less than 30 hours per week on average at any one job. The New York Times (4 July) reports that private insurance plans are demanding increases of 20 to 40 percent for 2016. And through its “risk corridor” program, the ACA guarantees federal subsidies to insurance companies if they fail to reap sufficient profits during the transition to the ACA! Employer-sponsored plans are generally marginally better when they are offered (required for most wage workers averaging over 30 hours per week), yet most still leave poor and middle-income workers in a catastrophic financial state before “insurance” kicks in. Again, there is the monthly premium, a significant effective pay cut. Three-quarters of company-sponsored plans, according to the Kaiser Family Foundation, have a single-member deductible of over $1,500, and the average annual out-of-pocket limit is $3,000-$3,500 dollars. So for singles, the maximum deductible – the amount a patient must pay up front before insurance covers anything – is greater than the average total financial assets of the median household above the poverty line! On top of this, there are the several hundred thousand mainly low-waged, part-time workers who have had their hours cut to less than 30 a week so that the employers don’t have to offer them health care (see Ben Casselman, “Yes, Some Companies Are Cutting Hours in Response to ‘Obamacare’,” FiveThirtyEight, 13 January). Class Struggle Education Workers (CSEW) in New York already exposed this vicious anti-worker plan when it was being debated in Congress and at the time of its passage. See “On the Healthcare Crisis” (September 2009) and “Healthcare “Reform” Law: Bonanza for Wall Street, an Attack on Working People” (March 2010), reprinted in Class Struggle Education Workers Newsletter No. 2 (October-November 2010) and The Internationalist No. 32 (January-February 2011). This bleak situation was not created by the ACA. By every reasonable measure, the U.S. has long had one of the worst and most expensive health care systems among wealthy imperialist countries. Health care bills are the leading cause of bankruptcy for individuals in this country, and have been for decades. ACA has reinforced this perverse system while liberal Democrats like economist Paul Krugman crow about Obama’s historic “reform.” What’s new to the ACA is a huge incentive for companies to push to dismantle health care coverage that unions have established through years of protracted struggle. In 2018, an excise tax of 40% will kick in on benefits valued at over $10,200 per year for individuals or $27,500 for families, the so-called “Cadillac” plans. Unions are doubly vulnerable in fighting this attack on workers benefits, because it comes from the Democratic Party that they loyally support. In recent contract negotiations, union workers have seen employers following this playbook, demanding lower coverage and ending employer-sponsored plans. While some of the most well-entrenched unions, such as the New York City United Federation of Teachers, have been able to resist ACA-related cuts to their health care plans, in recent contract negotiations, unions across the country have succumbed to the employers’ blackmail. Even some allegedly “progressive” unions have gone to the bargaining table offering to slash members’ health care benefits right from the beginning of negotiations. This was the case in ILWU Local 5 covering workers at Powell’s Book Store in Portland, which Class Struggle Workers – Portland fought against. And across the board, increasing premiums and stagnating wages are forcing union members to make painful decisions about canceling optional enrollment for spouses and domestic partners. 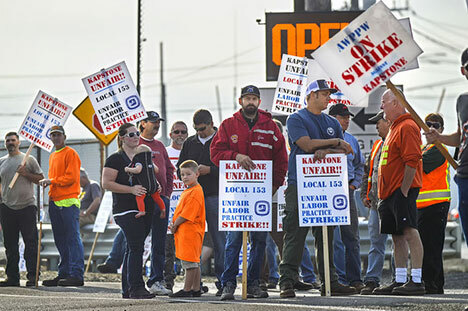 Recently, 800 members of Local 153 of the Association of Western Pulp and Paper Workers (AWPPW) at the Kapstone paper mill in Longview, WA were forced to go out on strike after rejecting a concessionary “final offer” from the company. The most prominent concession that the bosses demanded was to cancel the workers’ health insurance in order to avoid the ACA tax and replace it with a cheap “high deductible” plan. 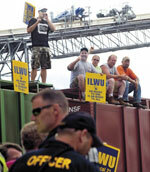 The strike was called off on September 3 when the company brought in scabs, but the fight continues. Meanwhile, 2,200 metal workers across the country have been locked out since early August by Allegheny Technologies, among them United Steelworkers (USW) Local 7150 at a titanium plant in Albany, OR, for refusing the company’s “offer” that slashed health insurance benefits. There, too, management is using scabs. Similar fights over essential health coverage are posed from coast to coast. Obamacare is one more weapon in the arsenal of the bosses’ offensive against the unions. AFL-CIO leaders have criticized the tax on union-negotiated health plans, yet they keep on rounding up votes for the Democrats. This sorry spectacle underscores that whether the issue is union-busting “right to work” laws or attacks on health care and retirement benefits, the key for labor to defeat these attacks is adopting a class-struggle program for powerful working-class action across traditional trade-union divisions, independent of and against all the parties of capital, Republicans and Democrats. There’s no need for any of this deadly mess that’s called the health care “system” in the U.S. – except the need for profit. U.S. reported corporate profits are at over $8 trillion per year. Even ignoring the fact that a socialized health care system would be freed from the disastrous anarchy, inefficiency and bureaucracy required by private ownership, the present U.S. health care system, the most expensive in the world, consumes around $3 trillion per year. Present corporate profits could fund it twice over with trillions to spare. But this isn’t a question of accounting, tax rates, or one that any “reform” of the present system could achieve. Union signs call to “stop the war on workers.” But that one-sided class war is the domestic face of the imperialist war U.S. rulers are waging around the world, and it won’t stop until it is defeated by mobilizing workers’ power, here and abroad. We can’t accomplish that so long as workers are bound hand-and-foot to one of the bosses’ parties. As the union tops once again throw their support behind the Democratic Party in the upcoming U.S. elections, worker militants must draw the lessons of their leaders’ support for the administration that designed the ACA bonanza for the insurance companies that is destroying health care for working people.